Syllabus of the Online Course (Subject): Russian Enterprises (Gazprom, Lukoil, Evraz, Wimm-Bill-Dann). Gazprom is one of the largest energy enterprises in the World. The core business of Gazprom is geological exploration, production, transportation, storage, processing, and marketing of hydrocarbons as well as heat and electric power generation and marketing. Gazprom supplies 25% of total amount of gas consumed in Europe. Rosneft is the leader in the petroleum industry of the Russian Federation, Rosneft ranks among the top publicly traded petrol and gas enterprises in the World. Rosneft activities cover exploration and production across all the hydrocarbon regions of the Russian Federation, Kazakhstan, and Algeria. Rosneft had a retail business in thirty-nine regions of the Russian Federation. TNK-BP is a leading petroleum enterprise of the Russian Federation and ranks among the top ten privately-owned petroleum companies in the World. TNK-BP is a vertically integrated petroleum enterprise, with business in Russia and Ukraine. 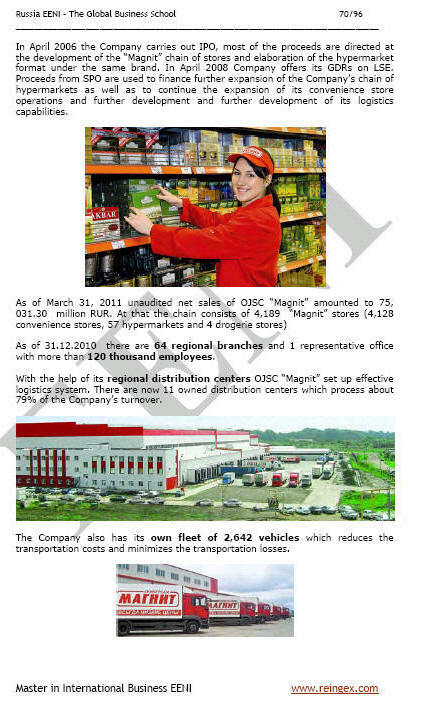 Magnit (Krasnodar) distribute his products in 2,400 supermarkets and hypermarkets in 760 towns and cities across Russia. LUKOIL is a global vertically-integrated petrol and gas enterprise. LUKOIL produces a broad range of high-quality petroleum and gas products and petrochemicals. LUKOIL retail network covers twenty-six markets. Surgutneftegas is the largest Russian petroleum manufacturer focused on production, exploration petroleum field development, refining, and marketing. The advantage of Surgutneftegas lies in the advanced petroleum production technology. The Petroleum of Surgutneftegas is supplied to the Russian refineries and exported to the Community of Independent Nations and Western Europe. Novolipetsk Steel is one of the largest steelmakers of the Russian Federation, with operation across mining steelmaking and processing, as well as logistics operations and management of the Black Sea port of Tuapse. X5 Retail Group N.V. is the largest retail enterprise in the Russian Federation (Europe). X5 Retail Group N.V. uses a multi-format strategy to develop three formats: soft discounters, supermarkets, and hypermarkets. Magnitogorsk Iron and Steel Works ranks among the largest steel producers in the World, is the leader in the Russian steel sector. EVRAZ Group S.A. Is a large vertically-integrated steel, mining, and vanadium business with operations in the Russian Federation, Ukraine, Europe, the United States, Canada, and South Africa; employs 110,000 people. Severstal is one of the leading vertically integrated steel and mining enterprises in the World with utilities in Russia, the United States, and Europe. Lebedyansky JSC is the largest natural juice manufacturer in the Eastern Europe and one of the Russian Federation baby-food market leaders. Mechel business includes mining, steel, ferroalloy, and power. Mechel owns three international trade ports and a transport operator. Mechel's products are sold in Russia as well as on international markets. Mechel employs 80,000 people. Norilsk Nickel is the largest manufacturer in the World of nickel and palladium and one of the leading platinum and copper producers. 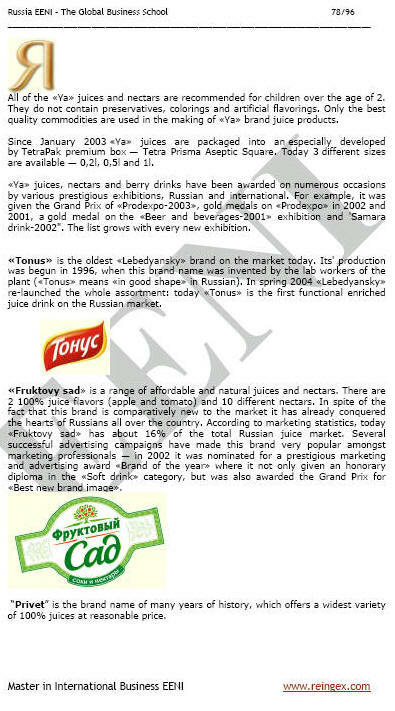 Wimm-Bill-Dann is the market leader in dairy products and children's food in Russia and one of the leading players in the market for non-alcoholic drinks in Russia and the Community of Independent States. Wimm-Bill-Dann has thirty-five production facilities in Russia, Ukraine, and Central Asia. Sedmoi Kontinent is an international retail chain and one of the leaders in the Russian retail market. The stores of Sedmoi Kontinent offer their customers a broad range of products and services of high quality, with a flexible price policy, always meeting the demands of the market and being high-tech retail sites. Polyus Gold is an international enterprise, the leading gold manufacturer in Russia and Kazakhstan and the only Russian enterprise among the largest gold producers in the World. Polymetal is a leading precious metals mining enterprise. The enterprise is in the top five global primary silver producers, the largest of silver and the fifth gold manufacturer in Russia. Ekaterinburg based Kalina is a leading Russian perfume, cosmetics, and personal care products maker, with operations in Germany and the Netherlands. It is the market leader in the skin care and oral care sectors of the Russian market. Founded in 1973, Raspadskaya is now one of the leading coal producers in Russia. Raspadskaya is a compact integrated coal mining and enrichment complex situated in the Kemerovo region of the Russian Federation.